E3 2015 is in the books. What books, you ask? Don't press me on these things, please. 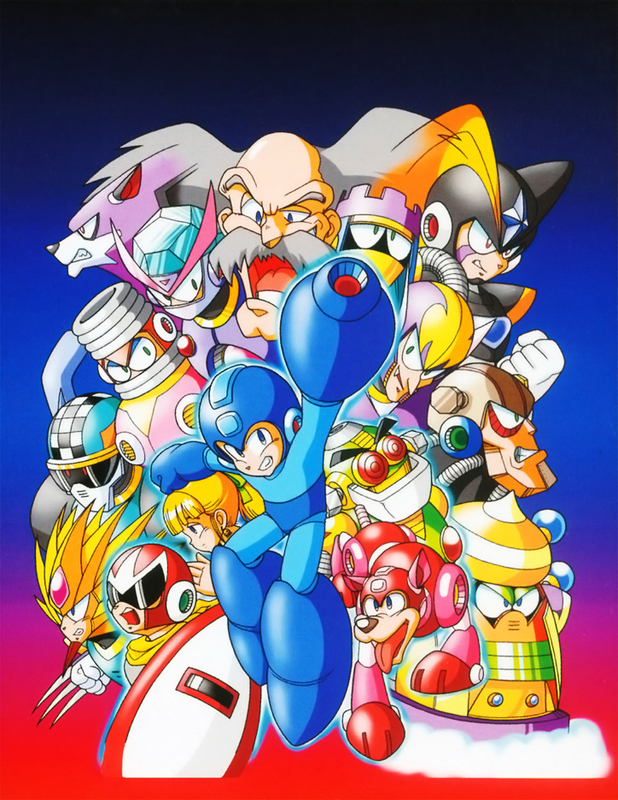 Instead of worrying about which books E3 2015 is in, why not check out this all-new retro review featuring one of my favorite video game series, Mega Man! 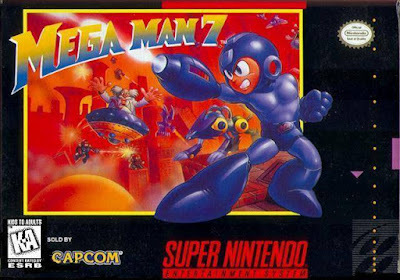 It's time to dive into the seventh installment of the series, the Super Nintendo's Mega Man 7. Let's see if it has the power of a charge shot or a weak little pea shooter instead. For a long time it seemed like a Mega Man game releasing was a common occurrence. 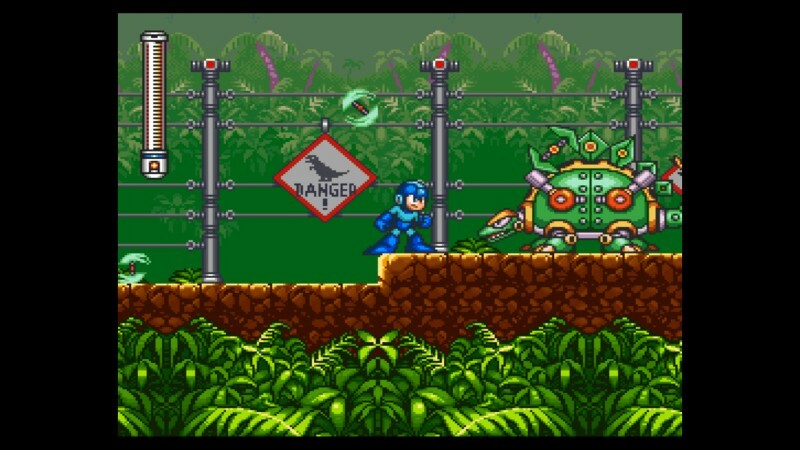 Heck, Capcom could have four Mega Man games releasing in one year-- and that's on the low end. Nowadays, we don't know what we've got until it's gone. Mega Man is seldom seen outside of rare cameo appearances. Still, we have a profusion of classic titles featuring the Blue Bomber to enjoy, and one such title is the Super Nintendo's Mega Man 7, also available on the Wii U Virtual Console. The latter, to me, is the better option considering most of us don't want have to justify spending over $100 to legally own a copy of the game. Mega Man 7's structure is a little different from what you've seen from past Mega Man games. 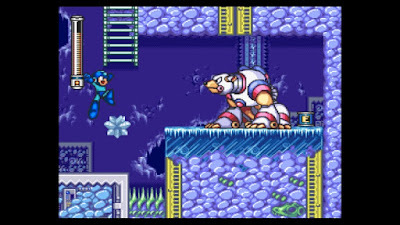 Yes, you still enter one of eight Robot Master stages and beat the boss at the end to absorb their special weapon, but this time around, Mega Man 7 begins with an opening stage that brings some narrative during gameplay. It's this dilapidated city street opening stage that has Mega Man meeting up with Bass and his canine companion (hmm, that seems a bit familiar) Treble. Is he friend, or is he foe? Mega Man's about to send this polar bear into hibernation... for good! 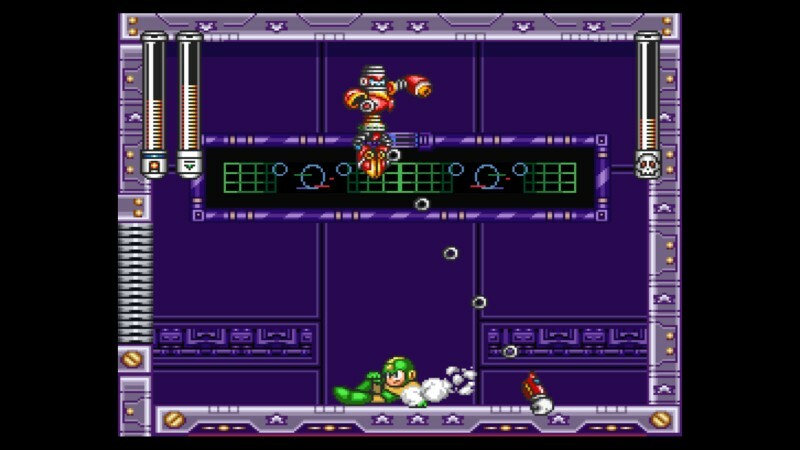 After finishing the opening level, instead of all eight Robot Master stages being available to choose from, only four are available from the start: Freeze Man, Cloud Man, Junk Man, and Burst Man. 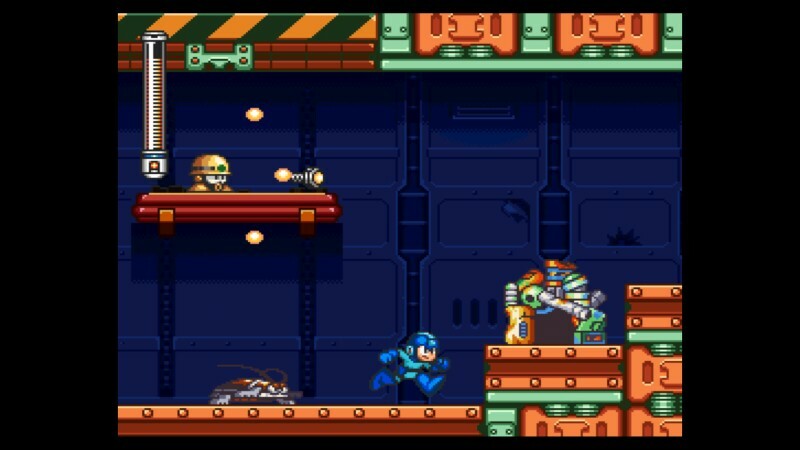 Upon defeating all four Robot Masters, an interlude stage at the robot museum takes place, and then after that, the other four Robot Master stages of Slash Man, Spring Man, Shade Man, and Turbo Man are available along with the ability to replay the other four Robot Master stages if you like. Junk Man's stage is in great need of an exterminator. This is different from past classic Mega Man games because in the NES series of six games, you couldn't return to a previously beaten Robot Master stage. With Mega Man 7, it's recommended to do so, as Mega Man 7 again adds more to the classic formula by having a heaping of collectible items that are optional but very helpful to gather. 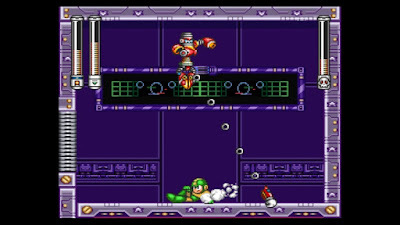 On the Robot Master selection menu, you can press the Select button to enter Auto's shop, where bolts that are found sprinkled in levels and dropped by defeated foes can be spent on various goods. These are goodies like extra Energy Tanks that heal Mega Man in the middle of battle, Weapon Tanks that refill Mega Man's weapon energy, and extra lives for those especially hazardous levels to Mega Man's health. 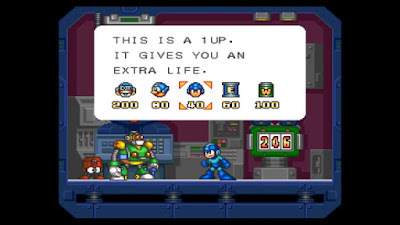 boosts for Mega Man's cause. As the Blue Bomber in Mega Man 7 is a much larger sprite than what was seen in the NES games, levels feel much more compact. This is especially apparent in vertical areas, where it's not very easy to see what's up ahead of you. As for levels themselves, Mega Man 7 features a robust collection of Robot Master stages that contain numerous obstacles, level hazards, and for lack of a better term, gimmicks, that will keep you on your toes and your palms sweating profusely. For example, Turbo Man's stage is one part tire factory, where you have to make careful jumps while avoiding getting bounced by the never-ending supply of tires being transported on the ceiling. The other part is a mad dash downward, evading deadly heat beams a la Quick Man's stage. 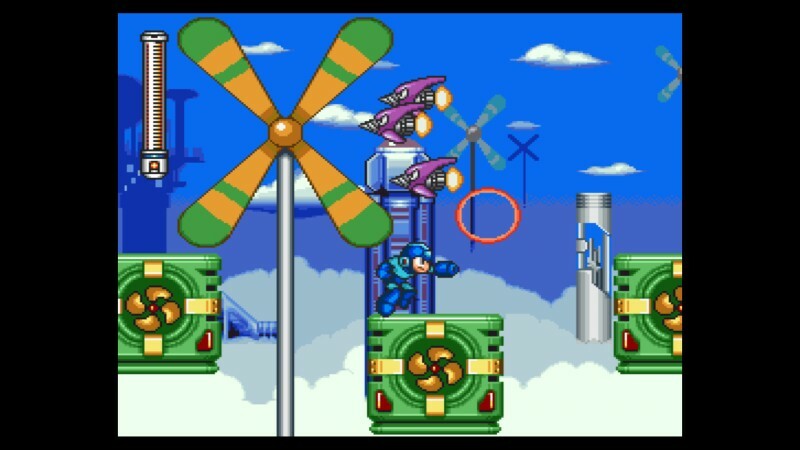 Then there's Cloud Man's stage which is all about perilous leaps over bottomless pits from suspended in the sky platform to platform. so don't let those enemies push you off, Mega Man! Each Robot Master stage coincidentally enough ends with a Robot Master battle. Each has their own attack patterns, some easier to dodge than others. It's to your benefit to figure out and use the weapon that that Robot Master is weak against (unless you're a total showoff, of course). Each time you defeat a Robot Master, you gain their special weapon. That weapon can be used on another Robot Master who it is weak against to make battles much easier than they would be otherwise. Obviously you can also use special weapons outside of boss battles, but you do have to worry about running out of weapon energy. This can be recharged by dropped items from enemies or through the aforementioned Weapon Tanks. at another time. You've got a Robot Master to beat! 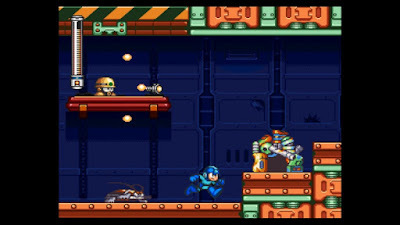 After the initial eight Robot Masters are taken down, Dr. Wily's lair opens up, It's a series of four stages that get progressively more difficult and offer the greatest platforming challenges within Mega Man 7. It also just so happens to feature what I consider the hardest final boss in the classic Mega Man franchise! Mega Man 7 is a short game, possibly spanning anywhere between 3-6 hours based on skill level. Since the game does not have a save battery, you need to record the sixteen digit password that displays each time you complete or exit a level. Then, when you return to the game, you have to input that password to pick off where you left off with all of your items and weapons intact. It's a pain of a process, especially when games with save batteries on the Super Nintendo were so common even at the time of Mega Man 7's release, but at least it's not an NES Metroid-length password! Jurassic World just released in theaters. Mega Man himself controls extremely tightly, offering great precision control. It's incredibly important for a precision-based run and gun platformer, so it's a godsend that Mega Man 7's controls feel so well done. 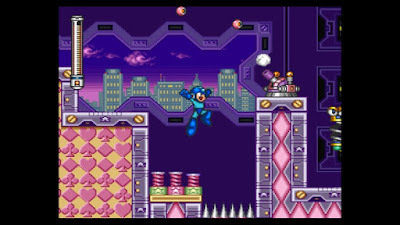 The visual style of Mega Man 7 truly uses the Super Nintendo's 16-bit processor to its full potential, offering vibrant levels, detailed and expressive character and enemy sprites, and impressive environments. There is slowdown to watch out for in particularly heated moments, which did mess me up once or twice while playing, so that's something to keep in mind. The music is suitably catchy, and is just as memorable as the NES stuff to me. That is to say that the music is still as awesome as ever. until you get skewered by some spikes. Mega Man 7 is seen as sort of a black sheep in the Mega Man line due to its larger sprites, which I didn't mind too much, and it being the only 16-bit game in the classic mainline Mega Man series. 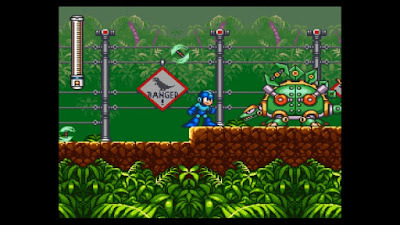 What it doesn't offer much in screen space, it does offer smart level design, challenging boss battles, and plenty of extras, against the norm of past Mega Man games. It's imperfect and pales in comparison to the greats of the franchise, but Mega Man 7 is a solid Blue Bombing experience all the same.